I came across these old photos this morning – so excited! Instead of going to work on time I immediately had them scanned at Grand & Toy (I am so technolame as not to have bothered to buy a scanner for home. In my world view, four or five skeins of a Handmaiden product is far more useful.). These were all made in late 2000/early 2001 or thereabouts. 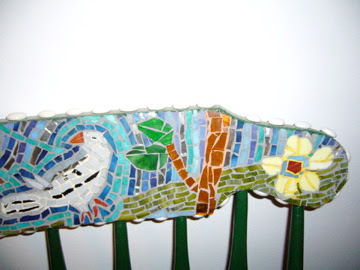 This was made for a very close friend and was photographed by him on his wall in this photo. It is approx. 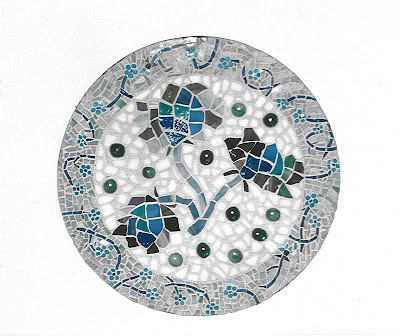 12-13″ diametre and the backing was made from the top of a lazy susan found in his building’s laundry room. 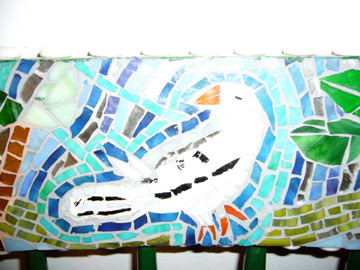 Patterns used were adapted from The Mosaic Idea Book by Rosalind Wates. 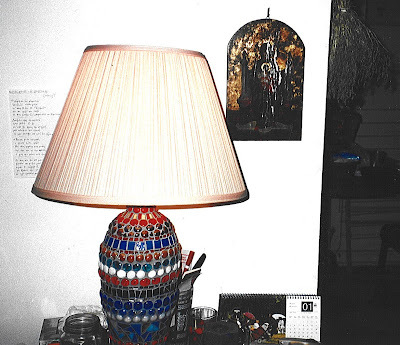 The same friend (a treasure from trash hunter extraordinaire…) gifted me a very ugly but functional lamp (sans shade) that he had found outside his building after someone moved. 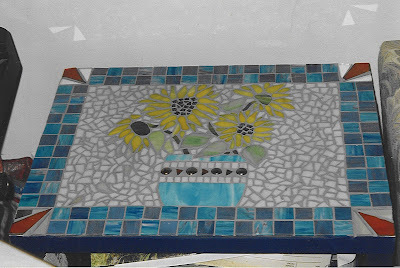 I decorated it with beads and stained glass, grouted it with silver grout and found a cheapo shade at Zellers. In this photograph, the Orthodox icon lends a nice irony, I think. I should note I am not religious, but very superstitious. In this regard, I have had icons on the east wall of pretty much every room in every apartment I’ve lived in, just in case. I have moved 15 or 16 times since coming to Toronto and the icons have always been the first things to go up, even before the phone (and later, the computer) was plugged in. 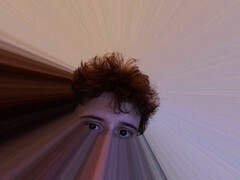 Although I’ve posted this before, this is the best picture I have of it. And I still love it. (or, by the look of it, the inside of a pub or three. 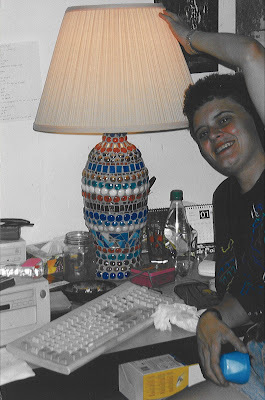 I think I had friends over that night and was bragging about the lamp). Given the level of sunburn on the face, this photo was likely taken in the summer of ’01. I base this assumption also on the 2001 calendar shown in the photo and the layout of the apartment. Having said that, it could well have been taken a year later than that – it would certainly not be the first time that I have forgotten to change the calendar from year to year. 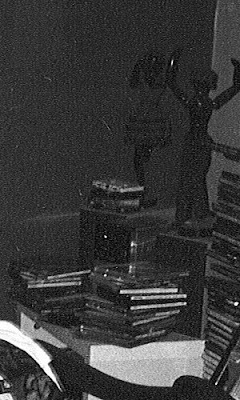 This photo is a fragment of one photo of several I took when, apparently not realising that I did not know how to use a camera, I went through a very pretentious “arty black and white” phase. The rest of the photo contains my mother, who was visiting… and it is actually quite a nice picture of her. (a) top corner: if you look very hard, you will see two shadowy figurines. They are those creepy little artist model dolls that IKEA had all over the shop at one time. 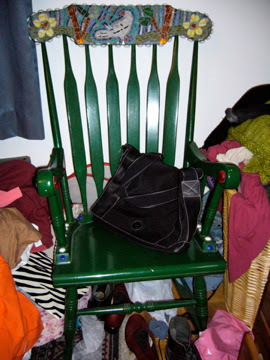 I had stained them mahogany and then outfitted them in little butch and femme outfits. For some reason, they then started to creep me out so I gave them away in the next move. See what I mean? Creepy. UGH. Of course, she looks far better when covered by dirty sheets and other laundry as it usually is. I had to leave the bag on the seat lest she feel naked – she is very sensitive and prone to catching cold in the harsh Canadian winters. I don’t recall what the significance of the blue strings attaching the bird to the tree are. I’m sure it was all very deep at the time, though. A tree trunk and a flower. Cool, eh? And… easy! Now, back to our regularly scheduled (if rather blah) programme. (c) bottom corner: do you see two funky patterned taper candles which are bent and twisted? This photo was taken during August 2001. At the time I lived in a 1920s walkup on the top floor in a corner unit with a tar roof and no AC. The week the photo was taken, temperatures reached over 35 degrees Celsius outside and well over 40 in my unit. I came home from work one day and the originally straight candles had morphed into what you see here. So, a little bit of nostalgia from the Millenial Annals of Brouhaha!